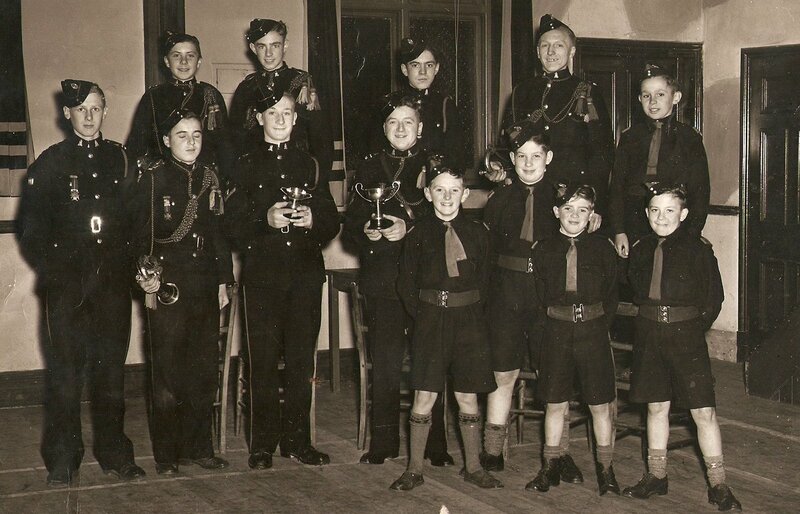 Church Brigade Lads c1950 - can you fill the gaps? Re: Church Brigade Lads c1950 - can you fill the gaps? CLB back row L to R:Bob Smith, Brian Morfee, Ray Taylor, unknown. CLB middle row L to R: David Seymour(? ), Barry Shaw, Keith Barber, unknown. JTC: of the 5 younger lads on right (with ties) the middle one at the front is Bob Ingham and the one behind him may be a Bradbury (son of the Market St Cobbler), the others are not known. Can you help identify anyone better? This great photo of Marple Church Brigade Lads provided by Alan McFall has been uploaded to the Virtual Tour this morning. The photo of the Church Lads Brigade (CLB) and Junior Training Corps (JTC) was taken in the old Parish Hall on Chadwick St. The company was attached to All Saints' Church. Names we know are added to the comments and pasted below but can you help fill the gaps or confirm any details please? CLB back row L to R: Bob Smith, Brian Morfee, Ray Taylor, unknown. CLB middle row L to R: David Seymour(? ), Barry Shaw, unknown, unknown. JTC: the 5 younger lads on right (with ties) are not known for certain by may include a Bradbury who was son of the Market St Cobbler (the taller one behind the front 3). The middle of the front three is thought to be Charlie Ingham, who was in charge of the CLB band and very much involved with Marple Prize Band later. The lad on the left of the front 3 also has the look of an Ingham too.